Global Aviation Weather Gives You Unparalleled Situational Awareness. TrooTrax Lets You Monitor, Alert, and Assist Pilots In The Field. Easily Access The TrooTrax Platform From a Web Browser, Your Phone, a Tablet, Or From The Control Room. Manage Profitability and Improve Safety By Generating Reports For Aircraft Maintenance. Access The TrooTrax Platform From Your Phone, Web Browser, Or From The Control Room. Troo offers powerful end-to-end satcom solutions for Flight Following and Flight Data Management. We supply some of the worlds top avionics companies with the tracking software, global satellite & cellular connections, and analytics engines that 1000’s of their customers depend on daily to monitor, measure, and manage their aircraft. Learn how you can better manage your fleet by tracking & monitoring your aircraft, viewing live global aviation weather, and more – all from one platform. Protect your investments by always knowing exactly where your aircraft are, how they are being flown, and automatically logging their usage/flight records. Track pilot behavior & deviation from flight plans. Automatic flight logs, record flight stages, exceedances, messages (squat, takeoff, landing, etc). Manage profitability and improve safety by using reports for: aircraft maintenance, trip details (used in logs), on-tarmac metrics (block times, takeoffs), squat switch and other I/O event reports. Every operator must consider weather before and during flight – so TrooTrax Weather Brief offers an integrated view of flight following overlaid with live & forecasted aviation weather, as well as the ability to display other live data such as no-fly zones, flight paths, and FAA ASDI data. Weather brief offers industry leading forecast models and products from Schnieder electrics. Built on proven industry technology –Schneider has 30+ years experience providing aviation weather reporting & forecasting. Choose from 40+ interactive weather layers. Get a quick visual representation, as well as in-depth descriptions of weather systems. TrooTrax offers the ability to provide flight data management (FDM) capabilities. Automatic capturing & recording of flight data helps operators monitor parameters such as airspeed, altitude, oil pressure, torque, fuel flow, and more. This data is invaluable for planning maintenance and responding to operational problems. TrooTrax operates in the cloud to continually watch over your remote assets checking device stats, landmarks (e.g. airports, hospitals), timed milestones and other data sources to automatically notify the right people the instant anything is out of the ordinary or not going to plan. Reduce pilot and operations centre workload by enabling your aircraft to communicate automatically without human interaction and provide alerts – to the right people, at the right time – if anything unusual is detected. Operators can establish performance ranges and schedule alerts when actual conditions are outside prescribed parameters. Custom reports also can be created to inform business decision-making and prove compliance with existing and emerging mandates. Troo does not manufacture any hardware – but we do support the largest selection of 3rd party tracking devices of any tracking company in the world. This allows our customers to select the best devices for their needs. Multi-vendor support enables seamless integration of legacy GPS devices while offering an easy path forward to the next generation of devices. Support for devices with 2-way text and voice communication – right within program. 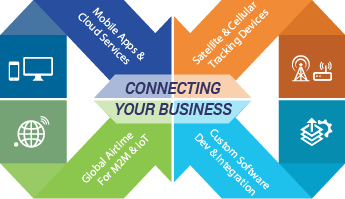 Troo works closely with satellite & cellular airtime OEMs to provide a seamless global network. Whether you are operating in rural areas outside of cell coverage or operate around the globe – our global airtime plans will keep you connected. Choose from Iridium or InMarsat’s global coverage, or Globalstar’s low-cost regional services. Features include: multi-network roaming, low-cost messaging, bandwidth optimization. Options for dedicated satellite, cellular, or hybrid hardware. Your data is secured with bank-grade encryptions and VPNs. If you require a solution we haven’t listed, contact us to see how our platform lets us easily build and integrate custom solutions just for your business. If you would like to integrate our powerful tracking and fleet management platform with your current dispatch, billing, or back-office systems – no problem. Our team will work with you to create a seamless connection between our software and yours. Troo was one of the first service providers to deliver 100% cloud-based M2M Location Intelligence. For over 10 years, and in more than 50 countries, we have been hard at work behind many brands supplying GPS Tracking and Geometric (Mapping) applications enabling business to better Monitor, Measure and Manage their mobile assets and operations.